The Perception Pescador Pilot is an affordable sit-on-top kayak packed to the gills with fishing features and complete with the included Pilot Drive pedal drive system. The Pilot Drive is performance-engineered to achievethe perfect balance of simplicity and ingenuity, and is ergonomically optimized for all-day hands-free fishing. Outfitted with a Captain's Chairwith on-the-fly adjustable gear tracks and tension knobs, four molded-in rod holders, two YakAttack accessory tracks, a transducer scupper,and two storage consoles for mounting electronics. The best feature? A price that propels the Pescador Pilot into a class all its own. I have owned my Perception Pescador Pilot now for almost a year and felt that I have field tested it enough to give it an honest real world review. I have used it in fresh water lakes and rivers, the intercoastal waterway and offshore so I have put it in every type of water one could fish. Overall I am very happy with the Pilot. I think for the price and what you get, you can't beat it. The weight is manageable even loaded with my fishing gear. I have done several YouTube videos showcasing the Pilot and some of the modifications that I have done. A couple minor issues with the kayak have been mentioned in previous reviews and involve the rudder line and wheel. The line becomes very stiff especially in saltwater. I have rinsed it after every time it's been in saltwater and have used lubricant on the line where it enters the run and they still get rigid and make the kayak hard to turn. Another issue with the rudder is the width, there are times when I am in wind and current that the boat will not turn quickly enough and this can be fixed by making the rudder wider. As also mentioned, the stability of the kayak in open water can be a bit of a challenge. I have poor balance to begin with so the stability was a factor for me. I ended up adding some homemade outriggers which give me the added stability I needed. A tradeoff for the stability is the weight, I am happier being a little less stable than having the increased weight. Even with a larger heavier kayak the amount of time I spent standing was far less than the time I would be loading/unloading, dragging the boat to the surf, dragging it out of the surf, etc.... so overall for me this is a non- issue, especially with the added outriggers. I added YakGear flush mount rod holders which fixed the issue of the rod holders being too shallow. It's a simple easy modification and they work great. Finally a major issue that I wanted to mention. I had the Boonedox Landing gear installed by the guys at Boonedox and they used my Pilot to do an installation video on closed hull kayaks. Everything worked great but after having the kayak on the landing gear out in the sun I noticed that one of the backing plates had ripped through the top of the kayak. I took the Pilot back to Boonedox and they plastic welded the tear and it's as good as new, but they did discover something that you may want to be aware of. The plastic on the top of the kayak is pretty thin so if you decide to mount anything or add landing gear this is something that you need to be aware of. Boonedox actually started making special backing plates that have since fixed any issues I had with the landing gear. This is obviously one of the areas where they used less of the plastic to save a little weight and if I didn't have the landing gear on it, it would probably never have been an issue. Some may read this list and think that there's a lot wrong with the Pilot, but that is clearly not true. All of the mentioned "issues" are very minor and the thin plastic would have never been an issue if I didn't add the landing gear. Now that it has been discovered the landing gear comes with correct backing plates so you won't have that problem. I have heavily modified my Pilot to customize it for the way I like to fish and with all the money I spent on it I have still spent less than about any other bare bones pedal drive kayak. If I were given $4000 and could get any kayak out there, I'd buy two more Pilots and have money left over. I have owned my Perception now for almost a year and felt that I have field tested it enough to give it an honest real world review. I have used it in fresh water lakes and rivers, the intercoastal waterway and offshore so I have put it in every type of water one could fish. Overall I am very happy with the Pilot. I think for the price and what you get you can't beat it. Took out my Pescador Pilot for the first time yesterday and am more than pleased. The pilot drive worked perfectly and the rudder performed flawlessly. If you're considering this kayak, don't hesitate to purchase. Also, Austin Kayak is the best when it comes to customer service. I read the reviews and got the red one! It was shipped to Eastern Washington by truck. I was concerned about the packaging and after I unloaded it at home I spent the next half hour taking all the layers off. Very nice wrap job! There were a few small shipping scrapes and I put a bunch more on her during my first launch (rivers got rocks). I took off and started peddling and realized I forgot to tighten down the foot peddles and arms. The screws kept backing out and I had to stop and try to tighten them (I later used Locktite). I wish they had thrown in a small tool kit for "those" kind of people. I got aggressive with the peddling and the "unit" jumped past the pin twice. Later I slide the pin plate forward and fixed the issue. I was shocked on how fast this thing travels with ease thru the water. I took it out and went directly into a strong wind, waves and was surprised how it cut thru it. I am 64 and the seat fits very well. I don't get wet sitting in this one. The rudder works very nicely. I recommend getting a paddle holder. It will get in the way of the pedals. The PPP 12 is a little heavy, but if you removed the drive unit and seat, it is very manageable. I can still pick it up one handed. This unit is very stable, I did not get the rocking effect when going sideways into the waves. Now I can fish, peddle and rudder my way around without fighting with the paddles and fishing pole at the same time. Cons: Still working on those... got to be something....but having to much fun to have one yet! This is my second yak from ACK. Always the best deal. No freight and no tax. Saved me a bundle! Love my kayak. The seat is so comfortable and I love how it sits high. Have had no problems with the pedals. When going on a long ride I like that I can oar for a while then I can switch to pedaling. I've put some miles in on this kayak, inshore and offshore. On calm days inshore standing up is no problem. Offshore I wouldn't recommend trying to stand up even on calm days. While launching this kayak in the surf I am able to pull myself onto the kayak no problem, it never felt like it was going to flip ever. My biggest complaint is the pedal drive, its loud. It also pops out of place very easily when pedaling normally so you'll have to put the drive back into place. It happens so much I would not recommend this kayak to anyone who is serious about fishing. Spend the extra money on a kayak with a better drive system. Perception needs to address the issue of the drive popping out of place. 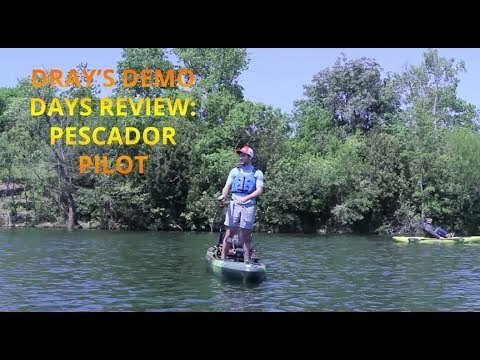 I researched, watched a ton of Youtube videos and looked at several pedal kayaks before I made the decision to buy a Perception Pescador Pilot 12 Pedal Kayak. Like a previous reviewer wrote, I was unsure if I truly wanted to spend $1799.00+ for a kayak (I actually was shopping to buy 2) so I wanted to ensure I made a smart and sound choice in regards to this purchase. I believe I did make the right decision and am happy with all but one detail on this kayak. The 4 molded in flush mount rod holders. However, this issue was easily resolved with an installation of 4 YakGear flushmount rod holder I bought here at ACK. One other thing is this kayak feels a lot heavier than 74 pounds. Other than those two issues this kayak is well worth the $1799.00 for the type of recreational fishing that my wife and I do. I only use the pedal drive in fresh water, just using a paddle when I am fishing at the Central California coast. You can spend up to $3600.00 on a pedal drive kayak but if your budget won't allow it or you just can't bring yourself to spending that much on a pedal drive kayak than the Perception Pescador Pilot 12 Pedal Drive kayak is the one for you. One more thing, if you're upgrading to this kayak you'll need some type of load assisting device if you're going to carry this kayak in a overhead kayak carrier rack. I live on the intracoastal waterway in South Florida. I ordered the sunset color which really good looking and high visibility so some idiot tourist is less likely to run me over. Well, lets start from the beginning. ACK has been great to deal with. It took about 8 days to get here, which I got over really quickly because shipping is free. The basic instructions on how to put together the pedal drive are fine. The drive is built really solid, nice thick powder coat and whatever metal that is exposed is beautiful stainless. I'm a little concerned about the plastic propeller. I can maybe speculate that they made it so it would break in case of an impact instead of the drive gear stripping. Will purchase an extra to bring with me. Would like to see a metal replacement propeller maybe, but time will tell if the original one will last. The online manual is very basic. So as soon as you get it, put it up on blocks, insert the drive and tighten up the four Allen bolts that hold it. They're not tight from the factory. I flipped up the rudder and latched it which centers it, then centered the rudder steering control, loosened the Allen screws then pulled the cables tight and cranked the screws tight. One suggestion I have is to offer pedals with toe clips so you power on your upstroke too. (I used to race road bikes) but that's really a personal preference kind of thing. The storage is huge. I have room for everything. The captains chair is so comfortable, it's so nice to have my feet planted flat while sitting. My neighbor has a $3500 Hobie Pro Angler, and I keep up with him no problem. Plus, I can go backwards, he has to get out his paddle or drop $800 on the new 180 reversible drive. I'd rather have 2 Pilots than 1 Hobie any day. It paddles pretty good too. Excellent product, excellent price. Best decision I've made in a while! I was very apprehensive about spending $1800 on a kayak, but after careful consideration and reading many reviews, I bit the bullet. Absolutely insane yak. The convenience of being able to focus on fishing rather than constantly paddling is invaluable. The more time my line is in the water the happier I am! The one and only flaw that everyone has mentioned is the molded rod holders. They are 110% useless for holding rods, but they hold a can of OFF! and my 3lb anchor nicely :) I bought a 2pk of flush mount holders for $9 on Amazon. Easy install, yak is now perfect. Ordering with ACK was also a wise decision. They shipped it for free, and it took less than 4 days from TX to MA. Ordered on a Thursday, it showed up Tuesday. The shipping logistics were also handled nicely, with excellent communication on the whereabouts of my new boat and an acceptable delivery time slot. All in all, I am extremely happy with the yak, as well as ACK's excellent customer service. I will use ACK for any and all future yak accessory purchases! Bought a pair of the Pescador Pilots a few weeks back, and absolutely love these kayaks. There are however, a few tweaks needed to get these absolutely right. From what I understand, Perception is constantly updating these kayaks as they receive feedback, so keep that in mind. Mine were manufactured in early April of 2017. 1) check the washers under the Quick Key. If there are 2 under the bridge, remove one. If you leave it as is, I find that it is hard to insert the pin with the drive up. If you remove both, it's too tight to install the key with the drive down. 1 under the bridge, and 1 at the top of the bolt is juuuust right. 2) Put marine goop (or equivalent) on the deck mounted gear (some of it is recessed bolts into a socket... don't worry about those). Every time I wash out my kayak, I get a decent amount of water inside. My wife's kayak does not have the same problem. I plan on gooping both anyway. 3) Unless you can dead-lift 85 lbs over your head, don't car-top these. I'm in (sort-of) good shape, mid 30s, and used to car- topping kayaks. I could not lift these. It was not only the weight, but also the lack of handholds. My old town sit inside was only slightly lighter, but I could always lift by the inside edge, and mount on a j-rack. I wound up buying a used kayak trailer, and it made a world of difference. Highly recommend. 4) There's another review on here that had an issue with the rudder cable fraying. Mine isn't to that stage yet, but the cable is definitely crushed, and tends to slip when I turn left. A better cable stop would solve that problem. All it uses is an allen key to pinch the cable inside a disk. A pair of aluminum tabs adjusted with a pair of allen keys (think picatinny rails for you gun enthusiasts) would have been a better design... also a slightly thicker cable. I am probably going to contact Perception in regards to the cable. 5) Get some scupper plugs for calm water. Getting up to speed forces water in the kayak, and if you aren't battling waves/chop, why have more water inside than you need? 6) The paddle holder is too far back. Get a roto clip from yakgear or something and mount in to the rail to the side. 7) There's a bolt on the sides of the chair that carves into the kayak. Do yourself a favor and wrap it in duck tape or something. 8) Don't try to break any speed records. You'll quickly figure out where the most efficient speed is. This isn't a road bike, and if you pedal as fast as your legs can go, you'll tire yourself out quickly, and only for a slight increase in speed. Take it easy. You'll go faster than any other fishing kayak out there (a touring would have you beat, no doubt), so don't worry about that. This is me being seriously over nit-picky here. This is a new kayak, and as such, there are always tweaks that need to be made, not to mention kayaks always require a personal touch to make it yours. Even with the minor (and I mean SERIOUSLY minor) flaws, this kayak is worth it. Compared to the $2500+ pedal and fin driven systems, the price difference makes any issues easy to overlook. Pros: Absolutely love the chair (afore-mentioned issue with bolt aside). I hate my current life vest, the back rides up too bad... get an inflatable PFD. Rails. OMG, the rails. Love the two front compartments, and the open storage in front. Lots of room for fishing gear. Both compartments already have a recessed hole for power cables to run, which is definately a plus. Nice and stable. Wobbles a bit more than my sit inside kayak, but that thing is a barge anyway. I've only been out twice anyway, I'm sure I'll get used to it. Pedal drive is awesome. A couple of pushes, and you're up to full speed. Start pedaling in reverse to kick in the brakes, or even go in full reverse (nice if you're trolling topwater... you can see the strike coming) Nice and low to the water (coming from a site inside). I was out in stronger breezes that would have moved my other yaks around, and this thing barely moved. A few spins in the drive kept me in the strike zone much longer. Bottom line, don't hesitate. Spend some time to get to know the kayak, and rig it the way you want it. There's lots of room for accessories and mods, and the sky (or your wallet) is the limit. Very stable and comfortable. I like the room when using without the motor, I'm not using the motor much cause I like the floor space . I have another flat top kayak its 12' also but I will only use the PPP from know on, my feet would go num, after an hour or so, i can put my feet flat on the floor and it.s so comfortable, i have one question though , do you sale the PPP kayak without the motor? Great so far. I've caught quite a few fish and it gets from "A" to "B" faster and easier than paddling. It makes the wind more bearable staying in one place. I worry a little about the longevity of the pedal mechanism as I've seen some metal shavings from the bolt holes already. I received my order the very next day and was no trouble to assemble. I have had it out on two lakes and so far really enjoy it. Being a cyclist also I find the pedaling position quite comfortable and you can go for hours at a pretty good clip (2 -3 mph). It is quite stable and the gear tracks easily hold my GPS and rod holder. I have also added a second paddle holder. The only downside is that the pin that secures the pedal drive does slip out occasionally when you really hammer the pedals. 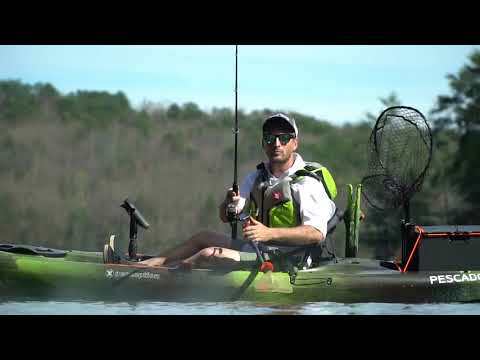 Overall a great fishing kayak that allows me to cover much more water. Took the yak out for the first time yesterday. Great boat. Handled chop and wind very well. It is very stable and tracks very well with the rudder. Also very easy to paddle. Only a few concerns. As everyone else has pointed out, rod holders are overly large and shallow. Can be fixed by making mods and adding flush mount holders. The more concerning issue if the Quick Key. Due to the slight side-to-side sway of the drive while pedaling, the Quick Key kept working itself out. Had to keep pushing it back in with my heel every few minutes. Will try to fix that with a spring clip. I would still recommend this boat for the money. Hopefully Perception can address these issues in the future. This is a great yak , has good speed and maneuverability I really like the pedal drive. The only negative I have so far is the the molded in rod holders. They are to big and too shallow. I wish they had stayed with the flush mount ones they had in the prototype. I have cut one out so far and installed a yak attack flush mount. But for the overall boat it's a thumbs up. Waited almost a year for this to come out and as soon as I could do my preorder with ACK I placed it. I have had mine for about a month now and love it! The kayak is very stable and the pedal drive is smooth and quiet. The only complaint I have is they did not put in the recessed area in the rear for the micro power pole like they said they were, I did get mine mounted so it was not a big deal. ACK was great to deal with! Q: How will this fair in salt water and tides? Looks like a very durable kayak! I live in NY, just want to make sure this will with stand everything out here before making a purchase. A: This should fair just fine. We would recommend washing the salt off with some fresh water after use, especially around the drive, and using some water-phobic lubricant. Q: The set screw which locks down the rudder control cable to the rudder control knob has broken the cable and striped the treads, where can I find a replacement cable and rudder control knob? Q: We are considering the Piolot 12. The 2017 had lots of issues. What makes the 2018 better? A: There will not be much a difference between the two models. Q: I have read there was a problem with the pedal drive not being secure and that Perception was going to remedy the problem with upgrades to the pedal drive mounts. Is the model that ACK is selling the revised pedal drive? A: Yes we are! Perception remedied this with a lock pin system, which all of ours will have. Q: Do you have to pull peddle gear out and turn around in order to back up or is there a switch? A: Thanks for your question! The Pilot Drive does have the ability to switch to reverse. Q: How shallow will the pilot run while still using the pedal drive? A: You will have about 12 inches of clearance before you need to pull the pedal drive out of the water. A: Yes, the drive is removable. Without the drive, the boat weighs about 66 lbs. The drive itself is about 19 lbs. Q: What are the dimensions of the two rectangular recessed areas behind the cup holder? Looks like a good place to add a switch panel. Thanks. Sorry if this posts twice. A: Those rectangular areas measure 9 in. x 3 in. and 5 in. x 2 in. Q: I am 230lbs and fish a few times/month. Would this kayaks weight capacity support me with necessary equipment? A: Thank you for your question. 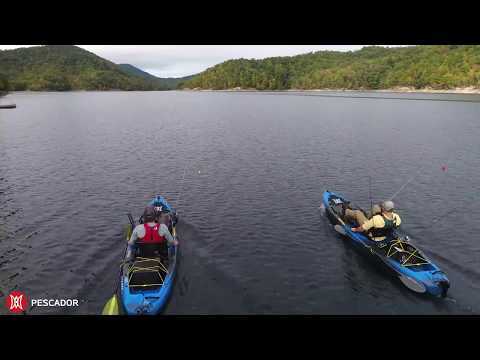 The Perception Pescador Pilot 12 Kayak's weight capacity is 525 lbs. This would leave plenty of room for all necessary equipment. Q: Do all the models that are shiped out now have the repaired drive system from perception? Q: Does the kayak come with a paddle or any extras besides the boat its self? Just the boat and the pedal drive, but well wroth it. I keep a paddle just in case. Q: Does this model allow you to pedal in reverse? Yes, you can pedal in reverse. A: Currently, the pedal system is not sold individually. It should be available in the Fall. Q: Can you preorder the Pescador Pilot 12 Pedal Kayak in the Sunset color? A: We only can pre order the colors we currently have on our website. Once we are done with pre orders and get these in we would most likely be able to special order the color.